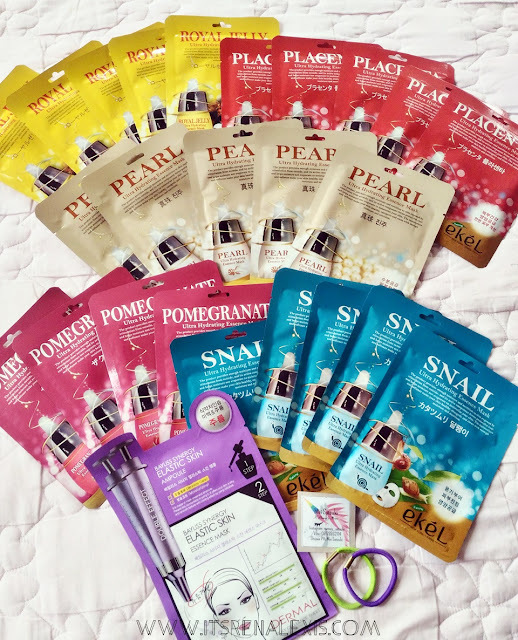 Last month, I discovered the joys of buying beauty products at Althea Korea. I have always been interested in skin care but it wasn't until last month that I got to know about the Korean Routine. I was instantly hooked as I watched videos after videos on youtube. I have watched A LOT but my favorites (aka most watched channels) would have to be Joan Kim, The Beauty Breakdown, and Hey It's Feiii. Add to that equation a friend who was as into the Korean Skin Care Routine who made the biggest help in enlightening me of all the confusing stuff, I was sold. I immediately looked at the many products Althea had to offer and before I knew it, I purchased 4 boxes of goodies in just a span of 2 weeks. The first box I got is Althea's Body Box. Now, these Althea Boxes are just screaming SULIT because you can get a lot of products at a very good price! Like this Body Box, I got all of these products for just a thousand pesos, while originally the total price for all of these would be P3760. So I saved P2700 for all 8 items!!! I have yet to use these products when I get home, for now, I've only tried using the Demeter White Musk Body Essence Mist and it was wonderful. It was really moisturizing and it doubles up as a perfume as it is very fragrant and it does not go away quickly. One product I was looking forward to getting in this first purchase, aside from the Body Box, was the Apate Black Pack. I have wanted a black wash-off mask for so long, so when I stumbled upon this product, I immediately put it in my cart. It has great reviews and has a high rating so I was really excited! Last purchase from Althea is this box full of skincare goodies! I happen to want to try the 10-step Korean skincare routine so I bought some products I wanted to try out. Moving on...My haul doesn't end here yet, dear friends. Forgive my shopaholic self. 😂😅 I have more Korean beauty products I bought from Shopee.ph and here they are! For the last items (and I promise, these are the last), I bought these Mizon products from another seller. I have a growing fascination with anything that contains snail mucins in them so I purchased this Snail Repair Eye Cream and this Snail Recovery Gel Cream as they were highly raved in some of the Youtube videos I've watched. And then, of course, the seller being so generous, gave me some COSRX samples and other freebies to try!